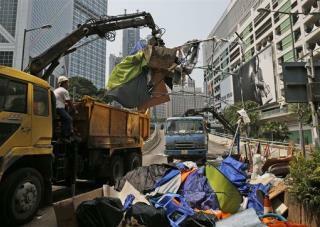 (Newser) – Hong Kong police cleared more barricades today from pro-democracy protest zones that have choked off traffic in key business districts for more than two weeks, signaling authorities' growing impatience with the student-led activist movement. Appearing to use a strategy of gradually chipping away at the three main protest zones, hundreds of police used chainsaws, sledgehammers, and bolt cutters to take down barriers made of bamboo and other materials that the protesters had erected overnight in the Admiralty area after a few dozen masked men stormed some of the barricades the day before. The protesters with their STUPID and non-passive barricade type activities are practically inviting the Chinese army from the mainland to come in and "clean-up". So this is a pro democracy group, or a OWS kind of group? China can solve all it problems by allowing the British to renew their lease on the Island to manage it for another 100 years. The British did OK the past 200 years. It would get mainland China off the democracy hook, and Hong Kong would still maintain commerce that could only benefit China.